Yesterday was Dustin's going away party. He's joined the Air Force and leaves for basic training today. I'm so proud of him! He's turned out to be a fine young man in spite of the "mail box incident". He was part of the West Bend/Mallard juggernaut that won the State football championship this past year. And, up until last week when the Air Force signed him on, he was a student at Iowa Central Community College in Fort Dodge majoring in Auto (and motorcycle) Mechanics. His decision to join the Air Force was based mainly on his desire to get a good technical training while seeing some of this world. His parents back him 100% in his decision and everyone is extremely happy for him (except maybe Amy, his girlfriend). To celebrate his new career his parents threw a party for him. Family and friends ate, drank, laughed and visited all day. His dad made a BBQ pork loin that was to die for. His aunt made her famous Cheesy Potatoes. Jackie brought four (!!) pies. Sister Nicole even joined in the spirit and made a chocolate cream pie. (Way to go, Nicole!) Deb brought a salad of cherry tomatoes and cucumbers which made us look wistfully out the window at the March wind-driven, cold, rain-before-the-snow (the blizzard is raging outside now...) and talk about the gardens we're going to plant this year. Bettina made BBQ Meatballs, Baked Beans, Green Bean Salad and a really good cheeseball. 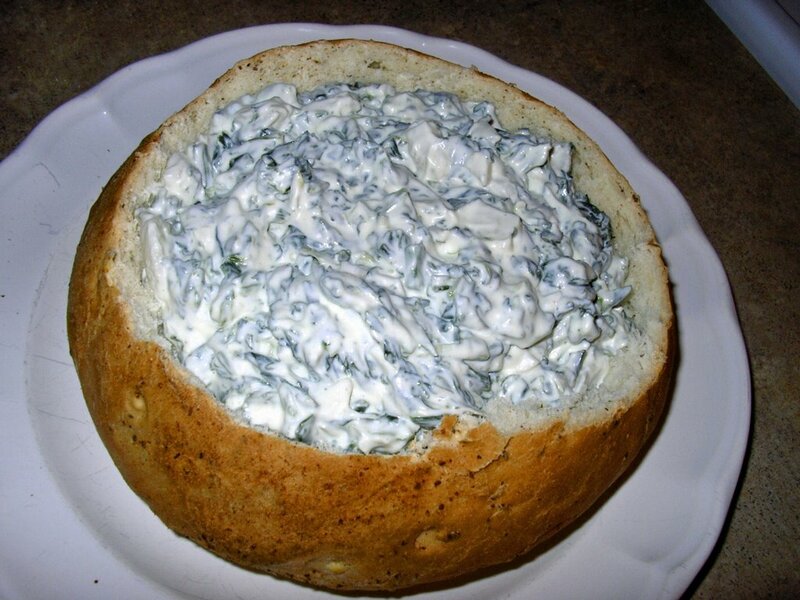 And I brought this Spinach Dip in a bread bowl as well as a fruit dip (which I didn't get a picture of). This isn't a very good picture of it as I took it right before loading it into the car to head over to the party. From the reactions at the party, I guess everyone liked it. I thought it was pretty good, too. I didn't make the bread though - I bought it at Hy-Vee. But, hey! I tried something new and it was a hit! So, I thought I'd share the recipe with whoever is interested. It's from Shawna over at AllRecipes.com. 1. In a medium bowl, mix together mayonnaise, sour cream, dry leek soup mix, water chestnuts and chopped spinach. Chill in the refrigerator 6 hours or overnight. 2. Remove the top and interior of the bread. Fill with spinach mixture. Tear removed bread chunks into pieces for dipping. All my best to Dustin! Thanks so much for inviting us. It was a pleasure and an honor. I'm going to miss that kid! I know you'll keep me posted on his progress.